Following the long weekend, NQ futures settled 150 points down, below the close on Friday. Tuesday’s sell-off presented day traders with some trading opportunity, but it wouldn’t appear to be the end of the uptrend. Prices are just 100 points above support, which should be particularly relevant this week. With very little room to trade down to Daily Support (shown as the blue Xs), the path of least resistance is for the market to make another earnest attempt to trade higher. This buy signal on the 60-min chart represents such a swing trade opportunity. Looking further, pay attention to if prices can trade up to 6828.25, Friday’s close. This will likely serve as a price to trigger some renewed selling. 6828.25 may be the fork in the road for the short term. If prices can breakthrough to the upside, there’s the potential for prices to continue through. At the same time, if prices fail to continue higher, the selling pressure may become self-reinforcing. 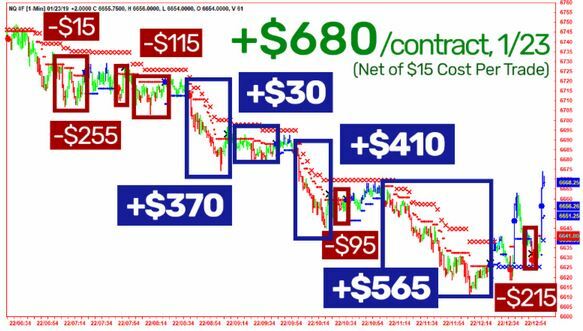 Were you there for this massive trade? © Copyright 2019 All rights reserved AbleSys Blog.